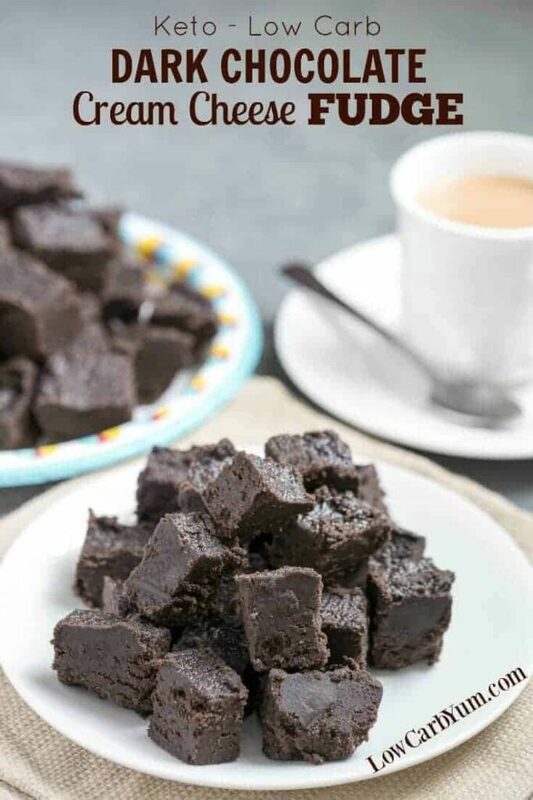 Satisfy your sweet tooth with this heavenly cream cheese dark chocolate keto fudge. 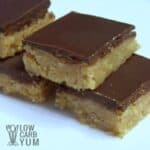 It’s a delicious low carb treat with only 3 grams net carb per large square. 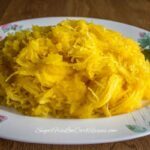 I’ve been really good avoiding low carb sweet treats. But, last week, I was craving chocolate so I decided to make up a batch of cream cheese fudge. I was looking for a texture similar to my cream cheese peanut butter fudge recipe. So I adapted that recipe into one to make dark chocolate keto fudge squares. A few people have asked if the whey protein powder in the original peanut butter recipe could be replaced. 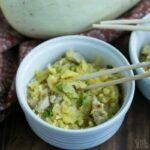 But, it’s needed to get the right texture without adding a lot of bulk sweetener. However, in this chocolate version, I’ve used unsweetened cocoa powder instead. I was a little worried that this cream cheese chocolate keto fudge wasn’t going to come out right. The oils did separate out as I tried to blend everything together at the end. Although the mixture didn’t come together as well as I would have liked, I spread the mixture out into the pan anyway. After sitting in the refrigerator for a few hours, the mixture did turn into a creamy soft fudge. At first, I cut the fudge into sixteen large squares. They were really big, so I cut those up into four smaller pieces. The perfect serving size is two small pieces so I calculated the nutritional data based on 28 servings. Since I’m trying to limit low carb sweet treats, I gave away most of this dark chocolate keto fudge. My coworkers ate most of it and I gave a small bag to my mother-in-law. The guys at work were all over this treat. They thought it tasted just as good as regular chocolate fudge. And, one of my coworkers who is dieting ended up losing weight that day despite eating three servings. 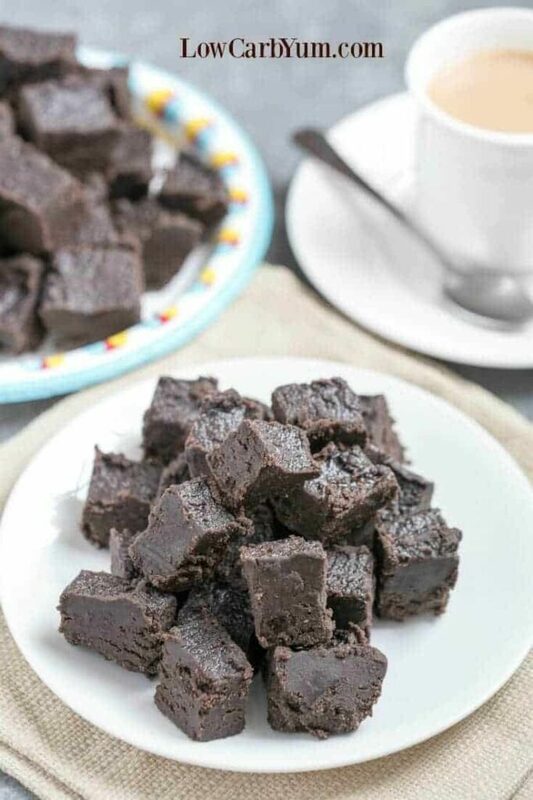 You can easily turn this cream cheese keto fudge into a chocolate peanut butter flavor. I used almond butter, but you can substitute that out with either peanut or sunflower seed butter. The almond butter flavor was detectable, but it’s so mild it didn’t interfere with the chocolate taste. 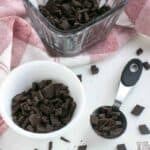 If you want to up the chocolate flavor, you can add another ounce of unsweetened baking chocolate. 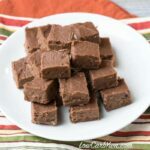 I plan to make this yummy keto fudge again, but will use peanut butter to change up the taste. For those with nut allergy, you can use sunflower seed butter instead. My coworkers loved this cream cheese chocolate fudge so much that I’ll bring them the peanut butter batch when I make it. 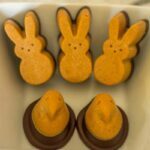 We will all be working a lot of overtime hours next month so that will be a good time to share these low carb sweet treats. 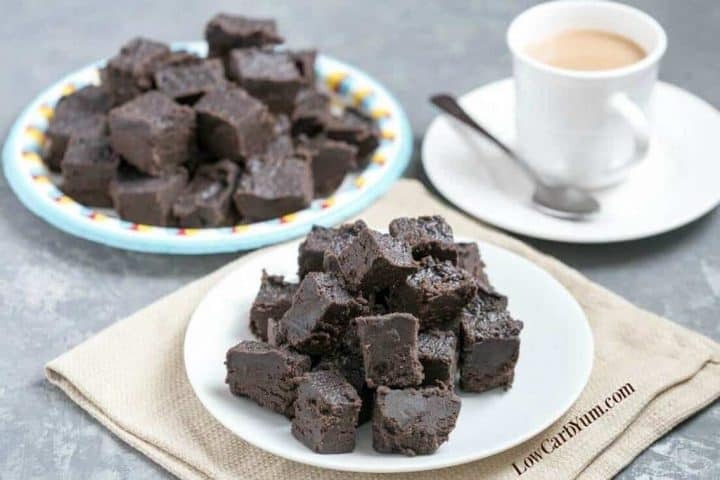 If you are on a really strict low carb diet, this keto fudge would make a wonderful fat bomb. There’s only 1 gram net carb for a very satisfying serving size. 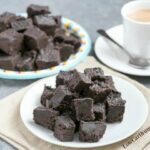 I’ve made a lot of chocolate fudge recipes that are low in carbs. 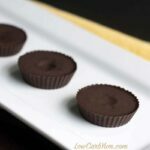 This recipe using cream cheese is hands down my favorite as the texture is very similar to high carb sugar loaded fudge. 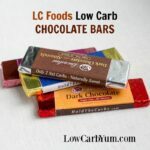 For those who want to check out more low carb fudge recipes, you can check out the collection I put together here. You certainly don’t want to eat this rich chocolate treat to often. But, it’s fine to have low carb sweet treats every once in a while. 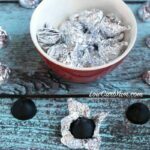 They even say that dark chocolate has many health benefits. How do you like to satisfy chocolate cravings? Satisfy your sweet tooth with this heavenly cream cheese chocolate fudge. 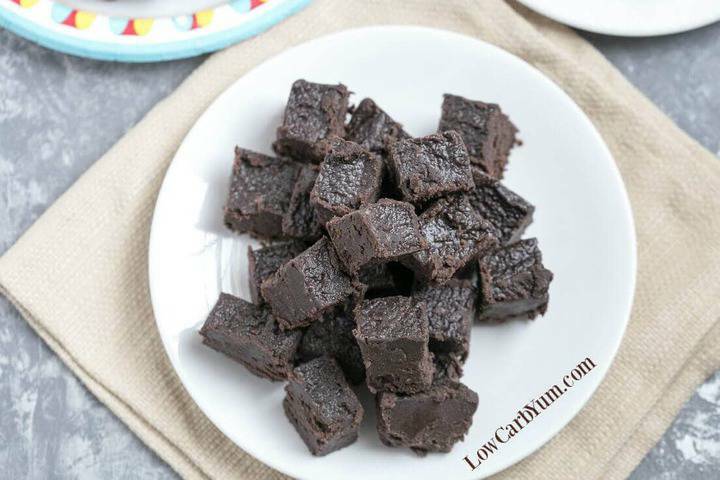 It's a delicious low carb treat with only 3 grams net carb per large square. 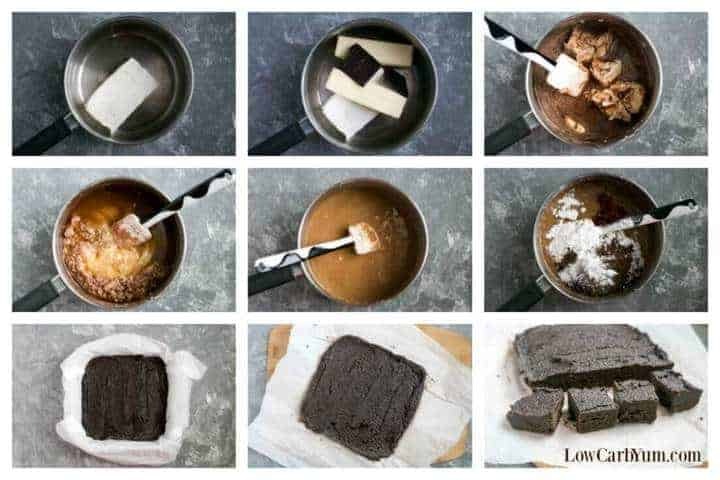 Melt together butter, and baking chocolate over medium heat. Add almond butter (or peanut butter/sunbutter) and blended in with an electric mixer. Then, blend in the cream cheese with an electric mixer. Spread mixture into prepared pan evenly. Chill in refrigerator until set. 1 teaspoon of stevia concentrated powder is equivalent to about 1 cup of sugar if you'd like to use another low carb sweetener. If you notice some oil separation, it will be okay once mixture cools. You can try adding a tablespoon of heavy cream and see if that helps the mixture blend together better.